There's a moment when playing Cave shooters, when your eyes glaze over, and you are no longer looking at the ship you are piloting. You start following the bullets, and as you move yourself through space, you just know where you are. It's a bit like Luke Skywalker feeling the Force flowing through himself. And as far as arcade games go, it's my favorite experience. Granted, it is possible to replicate that sensation at home on a console or PC. But on an iPhone? Are you bananas? Cave's iPhone games have been hit-and-miss. Its latest effort, DoDonPachi Blissful Death, is nothing short of brilliant. The game's trailer looked totally bonkers—the beautiful madness you expect from a Cave shooter. And from the few hours I've played with the game, it's delivered just that. The controls are responsive, the graphics pop, and the game is a lot of fun. Even the hardest mode, "Hell", was fun. The game's trailer looked utterly daunting. But Cave gives players the tools they need to enjoy the game. Though, I do wish the "bomb" button was in a different location, as sometimes finding it feels fiddly. From what I've played, the rest seems solid. 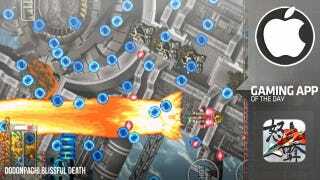 It's US $4.99, and if you like bullet hell shooters, this is worth checking out.